This additional rating will help you decide whether or not a game is right for you based on the level of involvement the game requires. K: Kids! This means that this game is designed or plays best with younger kids. It will not likely be a fun game for teens or adults to play with each other, but it’s always good to get ’em started early! Examples: Sorry, Memory, Hey! That’s My Fish! E+: Experienced! These games can generally be enjoyed by anyone, but tend to push the limit of complexity a little farther. You probably don’t want to start total gaming newbies off with these types of games, but most people can work their way up to this level after learning a few games. These are just to help you instantly see some basic games stats. This kind of information is usually printed on the box, but what’s printed on the box is not always perfectly accurate. These share, based on our experience, the realistic game length, and how many players the game is actually FUN to play with. 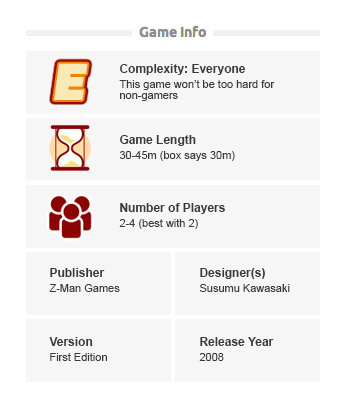 Note that the game length is generally what we think is the maximum playtime once your players know how to play. In addition, while many games often have multiple editions from various publishers, the information we post is based on the version that we reviewed.